Size of Male: 4-9 lbs., 8-11 in. Size of Female: 4-9 lbs., 8-11 in. A cheerful and graceful toy breed, the Papillon is easy to identify. It’s the breed with butterfly-looking ears, symmetrical facial markings and a wagging, plume tail. Many have erect ears, although some are noted to have the spaniel’s drooping ears. However it looks, you will take pleasure in the companionship of this happy-go-lucky bundle of joy. 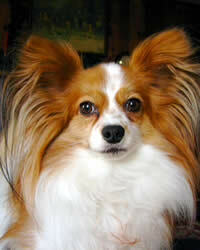 The Papillon dog breed descended from the 16th-century dwarf spaniels of continental Europe. They were the court favorite of French nobilities such as Henry III, Madame de Pompadour and Marie Antoinette. The proof is in the paintings! If you look at some royal portraits dated in the 1500s, chances are many will include this pampered, well kempt little dog. By the 19th century, the breed’s popularity spread outside of Europe and into America. Their place today is either in a loving home or in a dog show. A jolly, loving disposition makes the Papillon a very likeable breed. The dog is generally both polite and playful. Although they are friendly towards children, these fragile dogs are better off in the hands of caring adults. Your home can get a bit loud if you own this breed. The dog is such a nervous barker! On the brighter side, this characteristic makes the breed a good watch dog. Living Environment – No matter where you call home – a quiet townhouse or an apartment – the Papillon makes a fine living companion. However, you need to make sure you and your housemates are gentle, responsible people. These dogs are very delicate, so if you aren’t too careful, you can easily injure or kill the pooch with one accidental sitting, dropping or squeezing. Outdoors, a fenced environment where accidents, falls and injuries are minimized, is a must for this breed. These little dogs possess some chasing instincts and can wander away while trying to make play things out of rats, insects and birds. Because they do not tolerate the cold very well, never leave these dogs unsupervised outside. Grooming – Because they are medium shedders, and even though they don’t sport any undercoat, these dogs could use some regular brushing. The normal frequency is 2 brushings a week. However, if you want to show your pooch some extra loving, you may, by all means, comb the dog everyday. Occasional clipping and showers may be necessary to ensure that their feathery coat is free from mats and tangles. Overall, grooming requirements are minimal. Diet & Exercise – The ideal diet for this breed is a wet-and-dry mixture of proteins, fruits and vegetables. You may want to avoid giving raw meat to prevent bacterial growth and stomach upsets. Free feeding is strongly encouraged, but if you are a stickler to scheduling, experts recommend that you let your dog eat at least 2 to 4 times a day. Though bursting with energy, these playful dogs don’t require a large yard or a great outdoor adventure to be happy. They can meet what little exercise requirements they have indoors. Health – In the health and longevity department, these dogs sport an impressive record. This dog breed is generally not associated with any major dog health problems except for a few cases of progressive retinal atrophy. Nevertheless, do keep a watchful eye on some minor health issues such as anemia, epilepsy, luxating patella, and sensitivity to anesthesia and drugs. Housebreaking may not be this breed’s forte, but when it comes to advanced dog tricks and problem-solving exercises, Papillons are topnotch performers. You’ll be delighted with their capability to learn new things. These little dogs make fine show ring competitors and excellent service dogs. Just remember to be gentle yet firm during dog training sessions, as the breed can boss you around if you let it. I have a 2.5 year old male, neutered Pap. He is funny, lively, smart, curious, territorial, energetic and affectionate.